Our TAX ORGANIZERS have been used by millions of taxpayers nationwide to organize their tax data and thousands of tax professionals as part of their complete tax package. 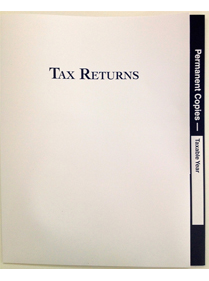 The ultimate in packaging your professionally prepared tax returns. Ideal for any tax return. 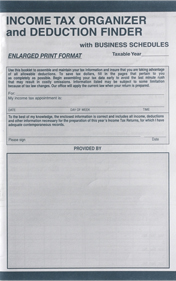 Learn more about our company, the invention of the tax organizer and get updates for the current tax season. We guarantee your 100% satisfaction, if for any reason you are not completely satisfied with any product purchased. We will happily provide you with a sample package of our current products.